4th of July – Keep Your Home Safe! 4th of July is a time for celebration with family and friends. This year, we will hit our backyards to grill a fantastic meal, jump into the pool, and cap the night off with some fireworks. Unfortunately for some, 4th of July is also a cause of insurance risks and claims. We want to be sure you have the information you need to keep you, your family, and your home safe this week! Did you know that cooking fires are the number one cause of home insurance claims around the 4th of July? Approximately 8,800 homes will be involved in a cooking-related fire each year, with the peak month being July. There are several things you can do to ensure you have a fun, and safe, cookout. Check and clean your grill. Before you start cooking, check your grill for any potential leaks or rust, and act accordingly to fix the problem. You’ll also want to clean out the interior of your grill, removing build-up from the cooking surface is important, but be sure to remove the tray and clean it as well. The build-up within your grill can cause secondary fires to ignite while you are cooking, so taking the time to clean your grill greatly reduces your risk of a cooking fire during your celebration. Set your grill up in a good location. It can be tempting to beat the bad weather and cook indoors, but your charcoal and propane grill should only be used outside. 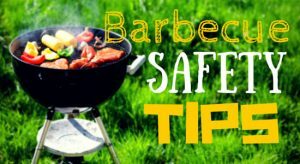 To ensure your safety, set up your grill at least five feet from anything that could catch fire, including railings, the side of your home, or overhanging branches. Monitor your grill. While you are cooking, take care to keep an eye on your grill. Ensure that no one who has had an alcoholic drink is utilizing the grill, and be sure to keep children and pets at a safe distance. While you are cooking, you should never leave the grill unattended, and don’t forget to turn off your propane and watch the grill until it cools down. Inform yourself. In the event that your grill flares-up, be prepared to take action. 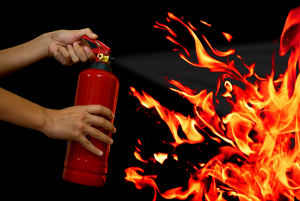 Keep a fire extinguisher nearby, and never try to put out a flare-up with water! Move your items to the opposite side of the grill until the flare-up dies down. Fireworks are a long-standing tradition for many 4th of July celebrations. If you’re going to be setting off your own fireworks this year, these are a few things you should know beforehand. Know your coverage. Fireworks damage isn’t always covered by your policy, especially if fireworks are illegal in your state, or if you cause harm to yourself. Review your state laws, and call your insurance agent to get information on what types of fires (and causes) are covered by your policy. Purchase an umbrella policy. If you want to ensure you’re covered, we suggest purchasing an umbrella policy. This policy is meant to protect you after you have reached the limits of your standard home insurance policy. Set off your fireworks responsibly. You should research the laws in your state regarding fireworks, and always work to be as safe as possible when setting them off. Even the smallest spark can cause a fire or injury. Here are our best tips to ensure you have responsible fun this week! Keep fireworks away from children. Never point fireworks at others, even as a joke. Always use your fireworks outdoors on a flat, hard surface in an open area free from debris or low hanging branches (like your driveway). Children should be kept at least 30 feet away from the location you will be placing the fireworks. Have a fire extinguisher on hand in case a firework is a “dud” or doesn’t ignite completely. It will also allow you to put out any fires caused by fireworks misfiring into trees or debris. Have a “designated shooter,” and don’t allow adults who have had alcohol to light any fireworks. If you have any questions about safety tips, or want to learn more about a home insurance policy before you get your celebration started, contact an agent near you! June is National Homeownership Month! We are happy to celebrate your home with you this month and want to be sure you’re protected all year long by providing insight on your homeowner’s insurance policy. Are you overwhelmed by your homeowner’s insurance and unclear on what each section means? This post will give you an inside look at the top five things you should know about Homeowner’s Insurance. If you still have questions or want to get a quote, reach out to our team today! Homeowner’s Insurance is property insurance to protect against losses and damages to your home and your valuables within your home. It also protects you in the case of accidents on your property. There are different types of insurance policies. Whether you are covered by an HO-3, HO-5, or HO-6, you should review your policy. Each type has unique coverage options when it comes to your home, its structure, and your personal belongings. No matter what type of coverage policy you have, you definitely need to know #2 on our list. There are three options for the amount of coverage you will receive in the event of peril: cash value coverage, replacement cost coverage, and guaranteed/extended replacement cost coverage. Cash value coverage is the least expensive coverage option, paying to repair or replace your property up to your policy coverage amount minus depreciation. Replacement cost coverage is the most popular kind of coverage, and acts exactly as cash value coverage, except depreciation is not deducted from your payout amount. Guaranteed/extended replacement cost coverage is the highest protection option, paying to replace your home to its state prior to the disaster, even if the cost to do so is above your policy coverage amount. Some belongings are covered outside of your home. Have you ever had your laptop stolen or misplaced a wedding ring? Your home insurance policy may cover the claim! Your dog can make a big difference in your policy. We all love our pets, but did you know that certain breeds of dogs may not be covered by your policy, or cause your policy cost to increase? Connect with our team to learn more about how you can make sure your furry friend isn’t negatively impacting your policy! You should create a home inventory. If the worst was to happen and your home was destroyed, your insurance company will need a list of your items to be replaced. We know you’ll remember the items you use daily, but having a list stored in your email, or photos of each room, will help ensure you get covered for your total damages. Do you want to learn more about insurance policies, or find out how Meramec Valley Mutual Insurance can help you find the perfect policy? Reach out today! Be Grill-Safe This Memorial Day! Labor Day is almost here and while it may signal the end of the summer season, the long weekend is the perfect time to bust out your grills and spend some time with your family. Here are some handy tips to make sure your end of summer grill out doesn’t turn into a safely hazard. 1. Keep your grill at least 10 feet away from your house. Farther is even better. This includes portions attached to your house like carports, garages and porches. Grills should not be used underneath wooden overhangs either, as the fire could flare up into the structure above. This applies to both charcoal and gas grills. 2. Clean your grill regularly. If you allow grease and fat to build up on your grill, they provide more fuel for a fire. Grease is a major source of flare ups. 3. Check for gas leaks. You can make sure no gas is leaking from your gas grill by making a solution of half liquid dish soap and half water and rubbing it on the hoses and connections. Then, turn the gas on (with the grill lid open.) If the soap forms large bubbles, that’s a sign that the hoses have tiny holes or that the connections are not tight enough. 4. Keep decorations away from your grill. Decorations like hanging baskets, pillows and umbrellas look pretty AND provide fuel for a fire. To make matters worse, today’s decor is mostly made of artificial fibers that burn fast and hot, making this tip even more important. 5. Keep a spray bottle of water handy. That way, if you have a minor flare-up you can spray it with the water to instantly calm it. The bonus of this tip is that water won’t harm your food, so dinner won’t be ruined! 6. Keep a fire extinguisher within a couple steps of your grill. And KNOW HOW TO USE IT. If you are unsure how to use the extinguisher, don’t waste time fiddling with it before calling 911. Firefighters say many fire deaths occur when people try to fight a fire themselves instead of calling for expert help and letting the fire department do its job. 7. Turn on the gas while your grill lid is closed. NEVER do this. It causes gas to build up inside your grill, and when you do light it and open it, a fireball can explode in your face. 8. Leave a grill unattended. Fires double in size every minute. Plan ahead so that all of your other food prep chores are done and you can focus on grilling. 9. Overload your grill with food. This applies especially fatty meats. The basic reason for this tip is that if too much fat drips on the flames at once, it can cause a large flare-up that could light nearby things on fire. 10. Use a grill indoors. People often think it will be safe to use a grill, especially a small one, indoors. NOT TRUE. In addition to the fire hazard, grills release carbon monoxide, the deadly colorless, odorless gas. That gas needs to vent in fresh air or it can kill you, your family and pets. on your home policy it may be time. President Calvin Coolidge proclaimed the first National Fire Prevention Week on October 4-10, 1925. Since then it has been observed on the Sunday through Saturday period in which October 9 falls, in commemoration of the Great Chicago Fire and the lesser known, but even more deadly, Peshtigo fire in Northeastern Wisconsin. Since then the entire month of October has been recognized as a time to learn about the ways we can prevent fires and how to stay safe if you ever encounter one. There are varying accounts on how the Chicago fire started out. Some say it was a falling meteor that sparked the blaze while others think it was a pair of teenage boys smoking in a barn. The most common theory though is to blame a cow. Shortly after the fire, a story was published saying a cow became jumpy while it was being milked and it knocked over a lantern. Public opinion may be different on how it started but the result was still the same. The Great Chicago fire killed more than 250 people, left 100,000 homeless, destroyed more than 17,400 structures and burned more than 2,000 acres. 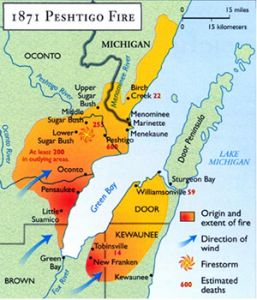 On the same day as the Chicago fire, a completely different fire started in the neighboring state of Wisconsin. The Peshtigo Fire roared through Northeast Wisconsin, burning down 16 towns, killing 1,152 people, and scorching 1.2 million acres before it ended. Most people haven’t heard of this fire though because of the attention drawn by the Great Chicago Fire, which was in a much bigger city. Historical accounts of the fire say that the blaze began when several railroad workers clearing land for tracks unintentionally started a brush fire. Before long, the fast-moving flames were whipping through the area ‘like a tornado,’ some survivors said. It was the small town of Peshtigo, Wisconsin, that suffered the worst damage. Within an hour, the entire town had been destroyed. These two historic fires changed the way that firefighters and public officials thought about fire safety, sparking the beginning of fire prevention week. On the 40th anniversary of the Great Chicago Fire, the Fire Marshals Association of North America (today known as the International Fire Marshals Association), decided that the anniversary of the Great Chicago Fire should be observed not with festivities, but in a way that would keep the public informed about the importance of fire prevention. Mold is the enemy of all basements. Once mold starts to form it’s not only costly to remove but can cause serious health problems like asthma, infections, cough, rashes, congestion and allergies (not to mention the smell). The best way to fight mold is through prevention. Here are some tips to ensure that your basement stays mold free and that your family can breathe easy. Mold thrives in environments with high humidity. One tell tale sign that your home is too humid is condensation on the interior of your windows is a direct result of water vapor buildup inside. Wet stains can also appear on ceilings and walls when moisture in the air is heavy. The best way to tell if your home is too humid though is to buy a hygrometer to directly test the humidity levels. A humidity reading of 45% or more is high and can be conducive to growth of mold. Buy a dehumidifier – this appliance is a great tool for lowing moisture levels in a basement. Make sure there’s good air flow – inspect your clothes dryer vent and ventilation fans located in the kitchen and bathrooms to make sure they lead airflow directly to the outside of your home. Another good idea is to open the door to your basement at least once a month and run an oscillating fan in the basement for between 1 and 2 hours to promote air circulation. Avoid standing water – If there are any leaks in the basement, take care of them immediately. Wipe the water from the area and dry it thoroughly. Use of a dehumidifier and heater to accelerate the drying process. Ensure that water is directed away from your home – the boundary around your home must be sloped in such a way that snow and rain are directed away from the house. Otherwise, and moisture will pool around the structure, increasing moisture and leakage problems. Make sure to clear any snow buildup by basement windows to prevent the moisture from leaking inside. Avoid keeping plants in the basement – Plants are great food for mold and mildew. Only grow plants in sunny, airy locations in your home. Clear the Clutter – Too many objects and storage items block the free flow of air and reduce ventilation. 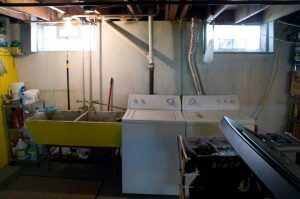 Items such as clothes and books stored in the basement are food for mold and mildew. Try to keep basement storage to a minimum and make sure your items aren’t stored with direct contact to the floor or walls. It’s also best to avoid drying wet clothes in the basement. If you do line dry your clothes indoors make sure you hang them in a well ventilated area. Keep wood elsewhere – Wood is another ideal habitat for mold so you should never store wood in the basement. An open, airy location is the best location for storing wood. Check pipes and consider insulation – Generally, cold water pipes in the basement show condensation on the exterior. Insulating such pipes reduces the humidity levels in the basement. If you suspect that your home has already developed mold it’s best to consult a professional about removing the mold from your home. Hopefully with our tips you can prevent a mold problem before it even starts! We may not like to admit it but summer is drawing to a close. While fall may bring some of our favorite things like apple picking and Halloween, it also means you have a new set of things to look our for to keep your home in top shape. So before the leaves fall and the wind turns chilly, it’s a good idea to do some seasonal maintenance on your home. Here are some things to add to your fall to-do list. Have your furnace inspected. It’s smart to have your heating system serviced before you actually need to use it. Experts say that as much as 75 percent of the calls they receive about homeowners without heat are a result of not having the furnace serviced and cleaned. It will also keep your heating costs down and help keep the air in your home clean and healthy. Apply that fresh coat of paint. Interior painting requires good ventilation, so the best time to tackle a paint spruce-up is in the fall when the humidity won’t be as high and your windows can be left open. Inspect your roof. You’ll want to check for shingles that are cracked, buckling, or missing. Check for caulking that needs to be replaced, or moss or lichen, which could indicate deterioration underneath. If you don’t trust your own assessment, work with a certified inspector. Check for mold. The humidity of summer can cause mold to flourish. Check locations such as around pipes, basements, or areas that don’t get the greatest air flow. If you do find mold you will want to have it removed by a professional as soon as possible. Replace weatherstripping on doors. There could be gaps that you can’t see and that can cause much higher energy costs. It’s a simple fix that can be done with items found at your local hardware store so if you can’t remember the last time you did this, make sure you add it to your list this fall. Check the airflow. Focus on areas like vents, the hood over your stove, dryer vents, baseboard heaters and room fans. Not only is a buildup of dust a fire hazard, but you also want to keep the air flowing and the allergens at bay. Get control of gutters and downspouts. Autumn may be a beautiful season but all those colorful leaves have to fall somewhere. Clogs in gutters and downspouts can cause the roof to leak, which can lead to a host of other problems. It’s a slippery slope from clogged gutters to water damage in your home. Look over your siding. You’ll want to look for any areas on vinyl siding that are buckled or warped. If you have wood siding, look for curling, splitting or cracking. Should you find an issue, you’ll definitely want it taken care of before the weather gets cold! Inspect your insulation. The most important area to check is your attic. You should have the highest concentration of insulation here. See if there are any gaps that need to be filled. You don’t need to check the insulation in your walls unless you notice heating issues. Make sure your detectors are working. Ensure both smoke and carbon monoxide detectors have fresh batteries. It’s smart to test them, also. Both are especially important once your furnace is in use. Each season brings its own challenges and wear-and-tear on your home, so stay organized and focused. With summer ending and autumn on the way, you can go into the new season secure that your home is in tip-top shape! Fun Facts for Labor Day! Labor day is almost here and we thought we would share some fun facts to get you ready for the holiday! Labor Day was designated a federal holiday in 1894, by which time more than 50% of the states were already marking the occasion. Canada actually beat us to the punch, designating Labor Day as a legal holiday in 1874. What sparked the emergence of Labor Day as a national holiday? Well, really long work hours. For most Americans and Canadians, workers used to work 12 hours a day, 7 days a week, some beginning at age 5. In 1916, the Adamson Act set up the 8-hour workday to address long work hours in factories. Thousands of workers took an unpaid day off on Sept. 5, 1882 to assemble a parade in New York City as a protest against unfair work hours and wage, thus marking the beginning of the movement for Labor Day as a national holiday. Oregon was the first state to make Labor Day a holiday in February 1887. New York, Colorado, Massachusetts and New Jersey followed shortly thereafter. No one actual knows who started Labor Day. Some believe it was Peter McGuire, general secretary of the Brotherhood of Carpenters and Joiners and a cofounder of the American Federation of Labor, who first suggested a day. Others believe it was Matthew Maguire, a machinist, who first proposed the holiday. The now traditional Labor Day parade was suggested in the original proposal of the holiday. Labor Day marks the unofficial end of summer, the start of school and the beginning of the football season in the US. It is also occasionally considered the day past which you cannot wear white without causing a fashion faux-pas, though that fashion rule is ceasing in popularity. Also, according to the National Hot Dog & Sausage Council, hot dog season begins on Memorial Day and ends on Labor Day. Many other countries celebrate May Day a holiday very similar to our Labor Day, dedicated to workers rights. Labor Day is the third most popular day for barbecuing, after July 4 and Memorial Day. More beef is consumed on Memorial Day than any other day, with the Fourth of July and Labor Day usually tied for second place. § Georgia O’Keefe, Boris Karloff, Chico Marx and Conrad Hilton were born. Meramec Valley has continued to provide quality insurance protection and personalized service to Missourians at a fair price. We look forward to providing insurance for another 130 years. Check on others for injuries. Monitor local news services. Keep your battery-operated radio nearby. If you are trapped in rubble, be prepared to be able to communicate with rescuers by tapping on pipes, or making other loud noises.